Announce your engagement to families and friends. If you families haven't met, arrange a get together. Choose your bridal party - bridesmaids and groomsmen. Estimate size of your guest list. Determine the wedding budget. Select a wedding date and time. Book the ceremony and reception venue. Determine the type of wedding you want (formal, cocktail, color scheme). Compile a preliminary guest list. Find a wedding planner if appointing one. Choose bridesmaids' dresses. Arrange fittings, alterations pick-ups and deliveries. 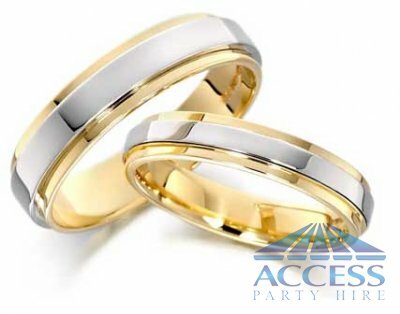 Arrange a quote and site inspection from Access Party hire and book the necessary equipment for your Wedding. Appoint a priest or celebrant. Book a florist. Choose and book your band and/or DJ for ceremony and reception. Select and secure a caterer (if not already provided by the reception location). Choose a florist and decorator. Groomsmen to find suits or wedding attire. Arrange fittings, alterations, pick-ups and deliveries. Select and purchase wedding dress, headpiece, veil and, shoes, bridal jewelry, etc. Select and purchase wedding rings/bands. Start planning for honeymoon and select a travel agent if necessary. Register a gift bridal registry in your favorite store. Select and order invitations and thank-you notes. Send out 'save the date' cards and organize an MC for the reception. Select and reserve accommodation for out of town guests if necessary. Finalize your guest list, and select and secure your wedding cake baker. Select and secure your wedding transportation, and Order the men's attire. Finalize any ordering that must be done prior to the wedding. If you are moving, begin to make arrangements and begin your packing.